Recovering from “mild” Guillain-Barré syndrome, and having waited for sufficient progress to have been made, I thought that I was well overdue a much improved quality of life and perhaps more importantly, that it was time for me take charge of my body and not become a victim of my illness. Symptoms were numbness and tingling legs and hands, severe upper body pain, and Bell’s palsy. I knew that there was no cure except time itself and the body’s own healing powers, but advice and research indicated that mild therapies might lessen the severity of the syndrome and accelerate recovery. Initially, I was impressed by Rachel’s credentials and in particular her therapy work and support with Cancer patients; then by her honesty because she had never treated anyone with my or similar illnesses. Progressively, and during the course of reflexology treatment – from very regular to now minimal – I realised that despite my early scepticism I was in the hands of a very able and skilled practitioner. I would have no hesitation in recommending reflexology for illnesses; and specifically I would have no hesitation in recommending Rachel to anyone – regardless of their condition or ailment – because whatever her inner turmoil, on the outside and to all external appearances she appears always calm, collected, and above all professional. It’s hard to describe the effects of reflexology until you’ve had it. Immediately afterwards – completely relaxed. It almost feels as if you have had a body massage but via your feet. Then for up to 24 hours the aches and pains with which both you and your body have become accustomed seem to intensify. And then – a relative calmness, and much less pain and discomfort than before. Reflexology – I’d really recommend it and Rachel in particular. I have been attending Apple Tree Holistic Therapies for a few years now and I would highly recommend it. I attend once a month and I alway really look forward to it. Rachel is an excellent therapist, very friendly and down to earth. I have recommened Apple Tree Holistic Therapies to many friends, many of which now attend once a month as a result. Holistic Therapies play a big role in my life and have had helped me in many different ways, but it is also important to get the right therapist who understands your needs. 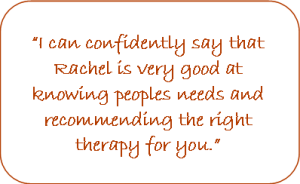 I can confidently say that Rachel is very good at knowing peoples needs and recommending the right therapy for you. As I enjoy holistic therapies so much I have now also started to learn Reiki. Rachel has trained me in Reiki Level 1 and 2. The Reiki courses are very enjoyable and up lifting experiences and I highly recommend them to anyone who has an interest in holistic thorapies. I cannot say enough good things about Apple Tree Holistic Therapies and recommend it to anyone! After suffering with back and shoulder pain for years and having no joy with anything my GP prescribed, I finally made the decision to get help in the form of Aromatherapy Massage. I found Rachel by chance in 2009 and have never looked back! Her skill, talents and understanding of what her clients need are invaluable. 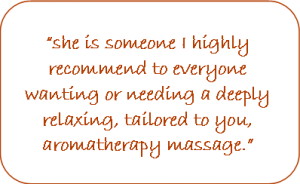 I see Rachel for treatments on a regular basis and, as well as becoming a great friend, she is someone I highly recommend to everyone wanting or needing a deeply relaxing, tailored to you, aromatherapy massage.